Safavieh Kes Multicolor Multi Garden Stool - 13" x 13" x 17"
Traditionally crafted in wood without legs or arms, the Japanese Kokeshi doll, became known as one of the most collectible toys and souvenirs in Japan. This 'opened heart' version features a Kokeshi with her arms wide open. Nyoman Suriani grew up following his father step of becoming a renowned stone carver. He now helps a good portion of his village in rural Indonesia. Being able to earn a good, stable salary working locally without the stress of long commute for work in the city is much appreciated by his community. Dimensions 3.0 In. X 7.0 In. X 8.0 In. I LOVE this doll. She's very heavy but she was carved from volcanic rock in Indonesia! I used her first as a garden ornament but due to her size she didn't attract attention. Now she sits on a table in my entrance hall. She has such a sweet facial expression. I've named her Sukee. I purchased this Volcanic Stone Open Heart Kokeshi Doll Statuette for indoor use only. It is definitely rock solid but can tip over easy so be sure to have it in place where it can’t and cause injury to someone. This looks great in my Oriental garden. Not the usual Buddha everyone has. I'm sure it will weather just fine. So cute. Just had to have it for my porch. I glued it to an up[side down clay pot to give her added display height. 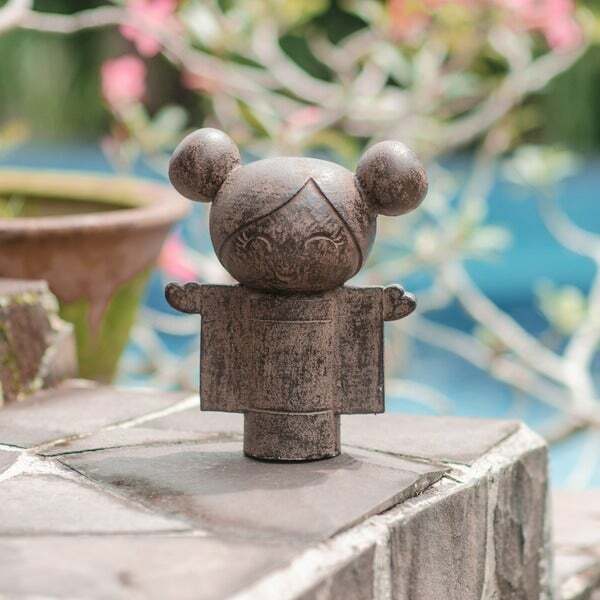 I loved this volcanic stone open hear doll outdoor statue. It arrived quickly &amp; packaged well. It's a great compliment to my yard. I would recommend this item! This is a very heavy, very solid little piece of decor. She makes me smile every time I see her. She’s on my bookshelf now but will be moving outside when I create a perfect little spot for her. Adorable and unique! Gave it to a very good friend for her birthday. She has gotten so many compliments! My wife loves it! Made a great Christmas gift. Item was delivered within days of ordering it. Definitely recommend. She brings you joy. Super cute and love how heavy it is. He's cute as the dickens, but he is VERY heavy. I absolutely love it. I watch an asian cartoon called Puta and this looks like her. "How much does the Kokeshi doll weigh?" Hello macandava, I hope your day is going well. The shipping weight of the doll is 10 pounds. Thank you for shopping with us.